Dame Patricia Routledge was recently back on stage – albeit seated – in the small market town of Horsham, Sussex, just north of Brighton, in an hour long show called Admission One Shilling. The 90-year-old star of Keeping Up Appearances reprised her earlier collaboration with pianist Piers Lane to tell the story of concert pianist Myra Hess’s World War II lunchtime concerts, which began at the start of the Second World War and lasted for six and a half years. The concerts, which cost a shilling to attend, took place in London’s National Gallery, amid a flurry of bombs. They were initiated by Hess as “spiritual nourishment” for the people of London after the Government closed down museums, galleries, theatres, picture houses and other places where large groups of people might be injured owing to the constant barrage of bombs. As well as London, Hess played in other bombed-out cities. She would eventually perform at 1,698 lunchtime events attended by three-quarters of a million people, include Dame Routledge, who heard her play in 1944 or '45 in Liverpool. The idea for the production came about several years ago when Routledge attended a celebration of Hess and her concerts that Lane had organized at the National Gallery and someone in the audience noticed Routledge was present. “She [meaning Hess] is there!” said the audience member. “And it turned out she meant me!”, recalled Routledge. Although she doesn’t think they look anything alike, Routledge took it as a “wonderful compliment” and began a collaboration with Lane to devise a show about how the “great adventure” of the lunchtime concerts began. Admission One Shilling features music by Lane, interspersed with readings by Dame Routledge that are made up of Hess’s letters and reported conversations. 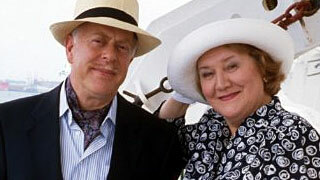 You can see Dame Routledge as Hyacinth Bouquet in Keeping Up Appearances weekday afternoons at 2:30pm on Afternoon Tea.